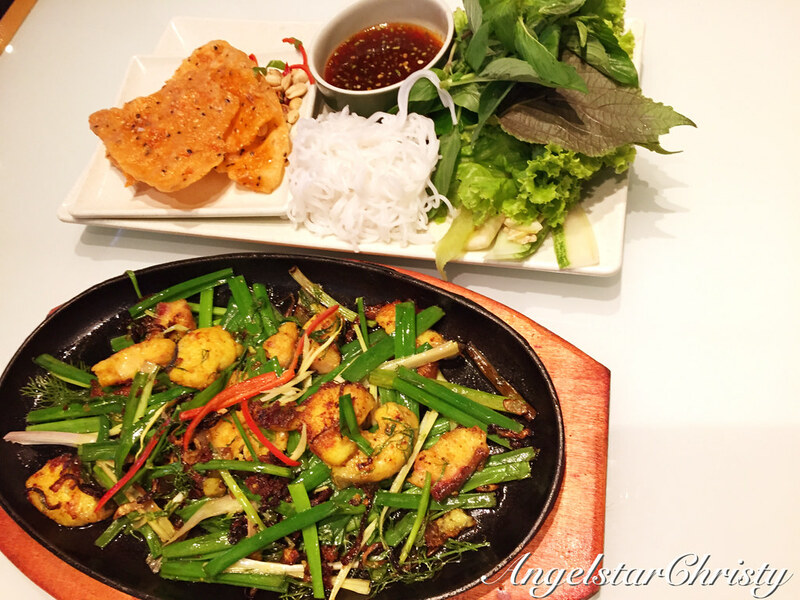 The varieties and choices offered by the Vietnamese cuisine just makes one spoilt for choices. If you have ever gone to a Vietnamese restaurant, you would understand, and that is even more so, when you are in the country itself. Surrounded by the local cuisine, which can be found everywhere the moment one steps out on the streets, it is just a big sign that the Vietnamese are still very attached to the tastes of home though there are evident signs of evolution among the younger generation who are succumbing to the temptations presented by the fast food restaurants bringing the international cuisine from all around the world. There is nothing wrong, it is just that addition of color to the existing culture and to open up the local senses to the world out there, as long as the original culture is preserved and not lost in the midst of the evolution. Times may have changed but the importance of one's culture and traditions ought not be forgotten, for it is what shaped the identity of the nation in the first place. The Vietnamese are still holding onto that value; thankfully, and it is what made the cuisine one of the gems in their country. I have tasted Vietnamese food when I was very young, thanks to my parents who celebrated my birthday with me with a scrumptious Vietnamese feast back then. It was not hard for me to look up the local spread when I was in Ho Chi Minh City either, and while street food was abundant, I was pleased that they have also evolved to integrate their local flavors into chain cafes or restaurants available in cosy ambiances. I would have very much liked to enjoy the food the Vietnamese style, sitting on the stool; which I would perhaps would dare myself to try on my next trip. (It's just my weak immune system to blame, that I have to be cautious with what and where I eat). 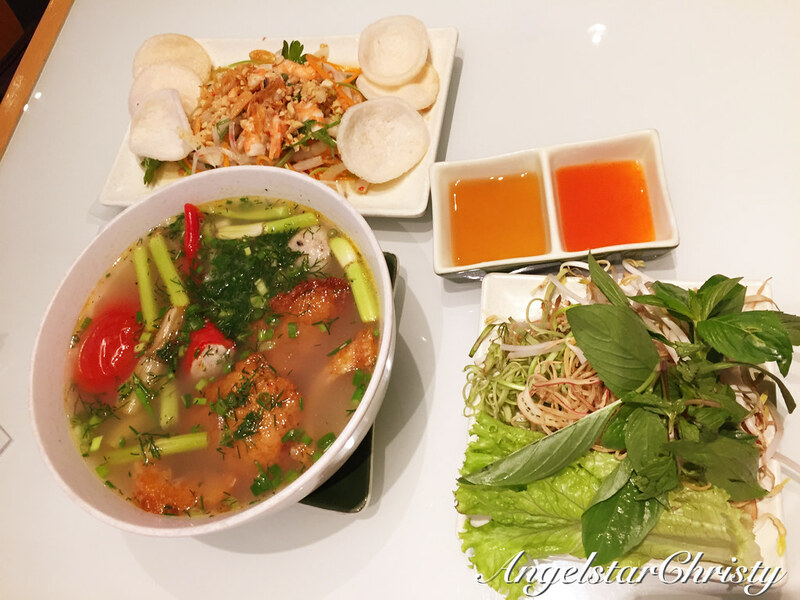 I will be sharing a list of local bites which I have managed to try on my earlier trips; just for that overview of the Vietnamese cuisine. The Thais may have their very own Papaya salad, and it is also commonly found here in Vietnam, but for a different yet refreshing kick altogether, this version of a salad does just as much to kick that appetite in place. Goi Ngo Sen Tom (VND58,000) (~MYR11) is a delightful mix of lotus shoots with shrimps, accompanied by fried shallots, sliced carrots, grounded nuts, coriander leaves in a slightly sweet vinaigrette dressing served alongside fried prawn crackers. 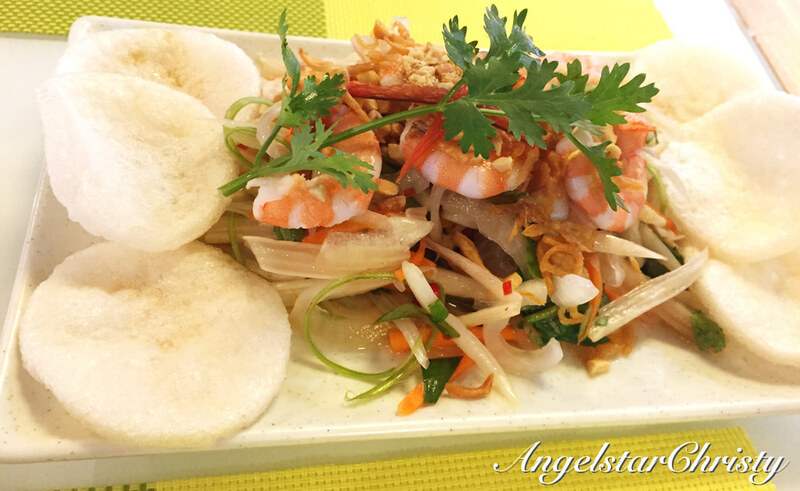 That's what the name stands for anyway, Lotus Shoot salad with shrimp. 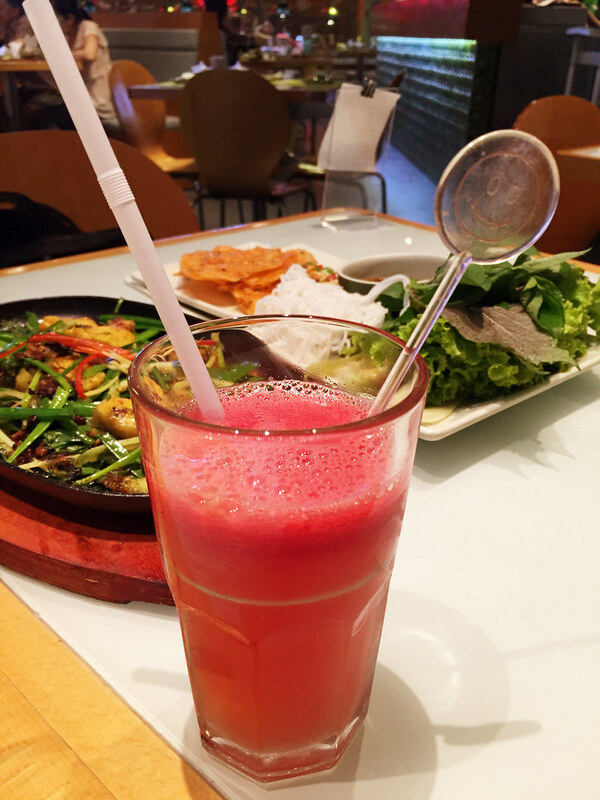 It is an appetizing way to start a meal, and it can be terribly addictive too. 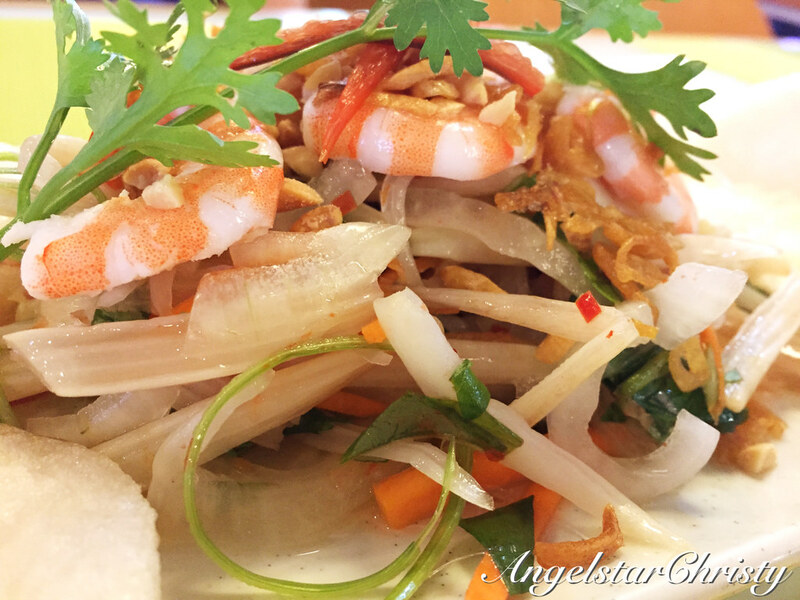 I love the juicy prawns paired with the crunchy lotus roots which just pack on that extra luscious boost when one bites on the combination, and the tastes are even enhanced with the flavorful complement of the dressing. The refreshing tastes from the dressing, I tell you, made all the difference. 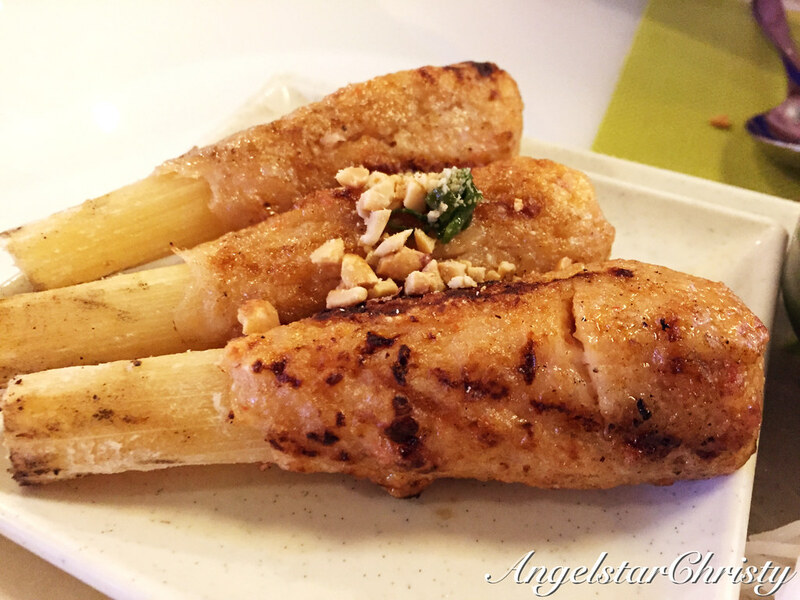 Choo Tom, or Grilled ground shrimp on sugar cane sticks is another dish worth mention. 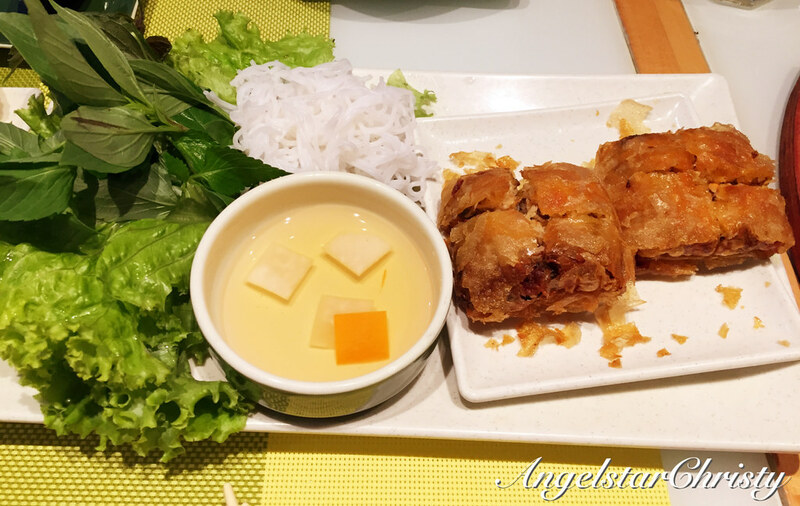 As with most Vietnamese dishes, there are always sides of raw and fresh vegetables and also the cooked rice vermicelli accompanying dishes like these; especially when it's an appetizer, or when it's fried. There is a reason for it as you will see in the following DIY tips. There is also a sweet sourish sauce to dip the sticks into, to give it that extra zesty flavor in its bite. Dip into the sauce or there is another way to eat it; which you can Do it Yourself. 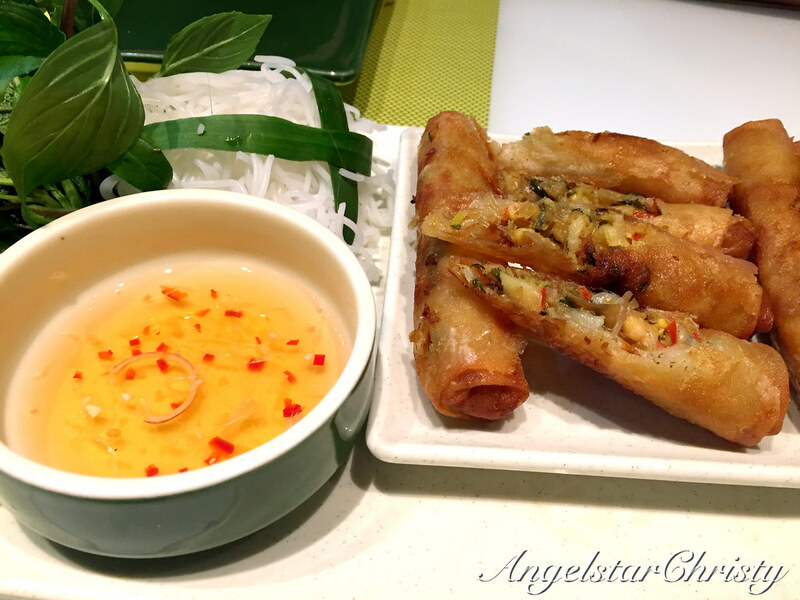 Wrap one portion of the spring rolls with the leaves from the vegetable plate, stuff the rice vermicelli, then wrap/roll it to your liking and finally dip it into the sauce. 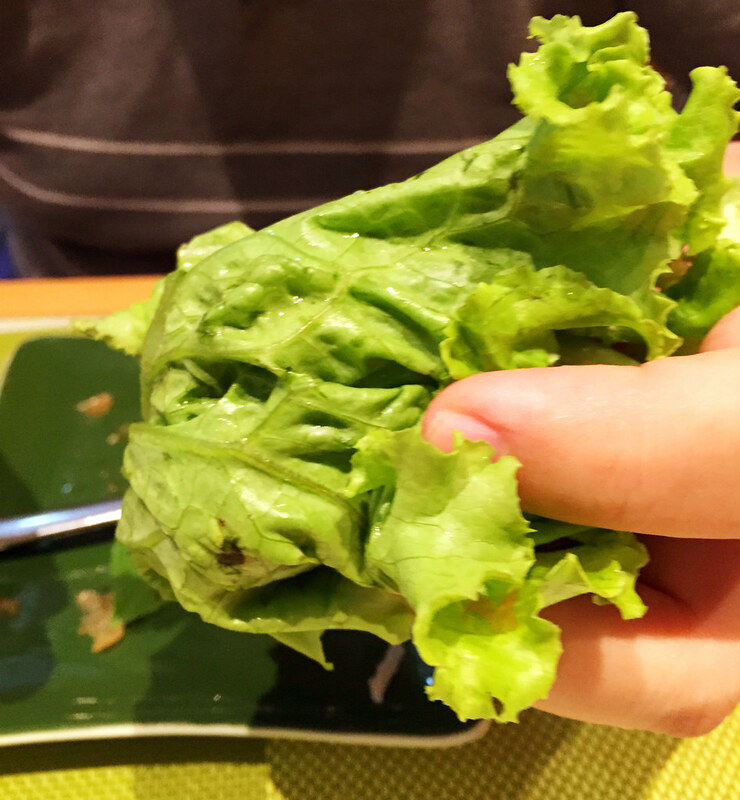 This is how it's like after you wrap it in the lettuce leaf. The shrimps have been grounded, as its name suggest, into paste form and it is an interesting idea to pile it on a natural source such as sugar cane to give it that all natural worthy flavor. 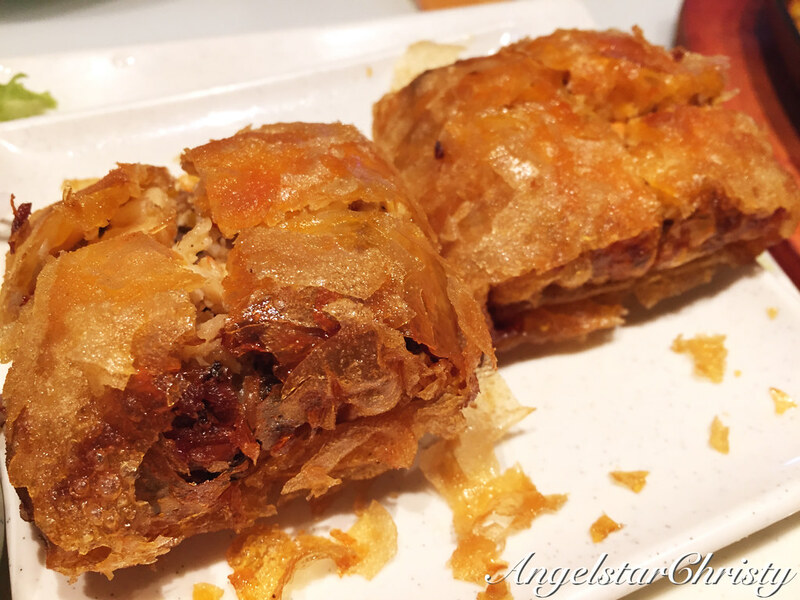 This is like our usual deep fried spring rolls (or fried popiah) stuffed with minced fish meat (not paste) alongside vermicelli strips and diced vegetables. The side of vegetables are also to suit one's personal preferences and to do it the DIY Wrap and Roll way as mentioned above. Folded in square pillow shapes, the luscious crab meat are stuffed into these enclosures and can be eaten the same way with the vegetables wrap or even like my way, where I just take it on its own. Either way, it is still just as good. 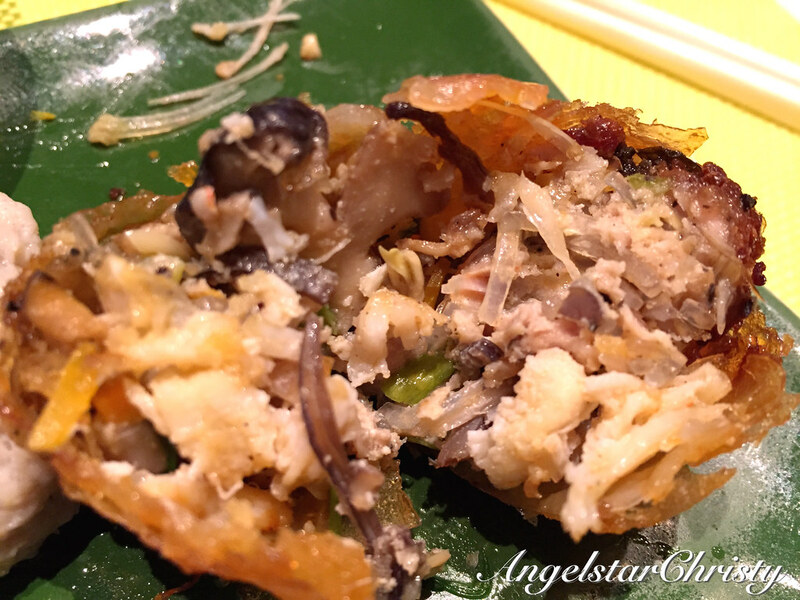 The thick bits of the crab meat, though in small pieces, are still made to satisfy one's tastes alongside the usual culprits of vermicelli and diced vegetables. One should never forget the dipping sauce, even if you forget the vegetables to wrap it in. It is the commandment to eat these spring rolls. 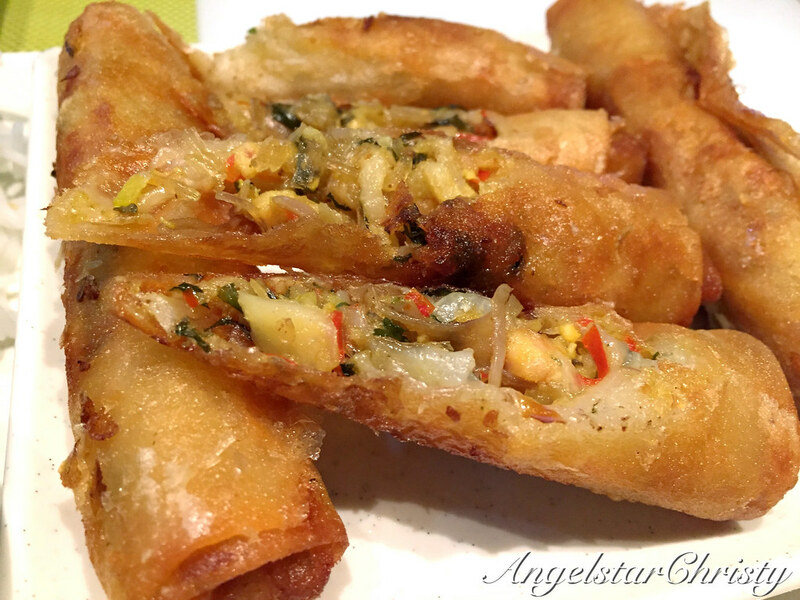 *If you've noticed, for the crab spring rolls, it's a different dipping sauce where this is a slightly lighter version with cubed radishes and carrots in fish sauce. 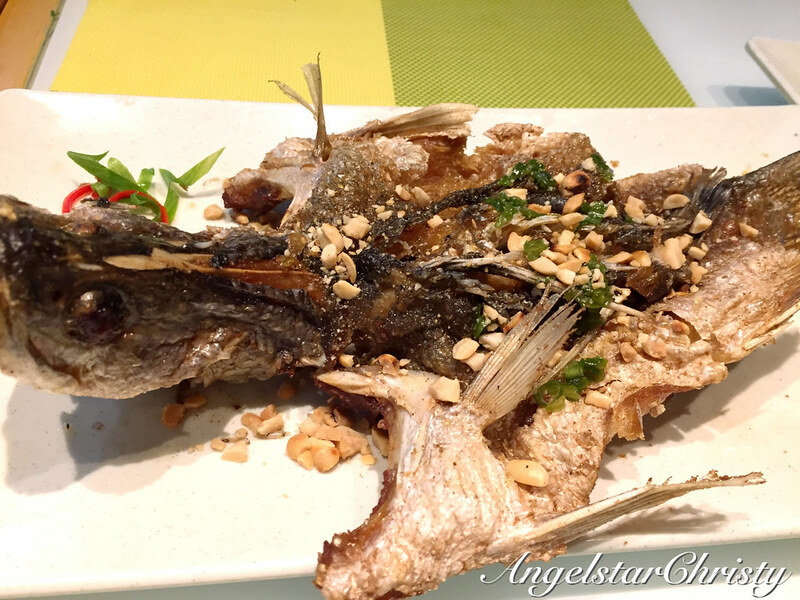 Fish sauce is one of the local favorite to go with any dish. 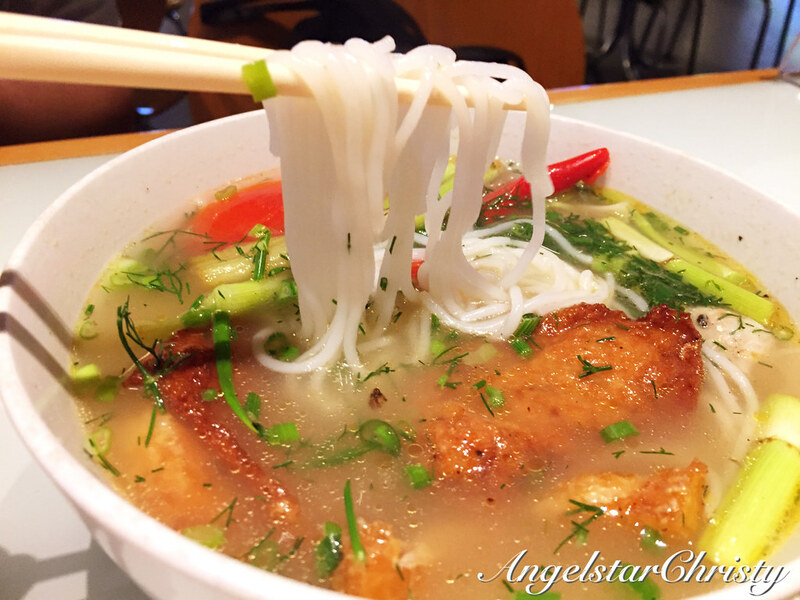 For mains, the Bun Ca (Fish with noodles) (VND78,000 or ~MYR15) is a simple yet fulfilling way to go. 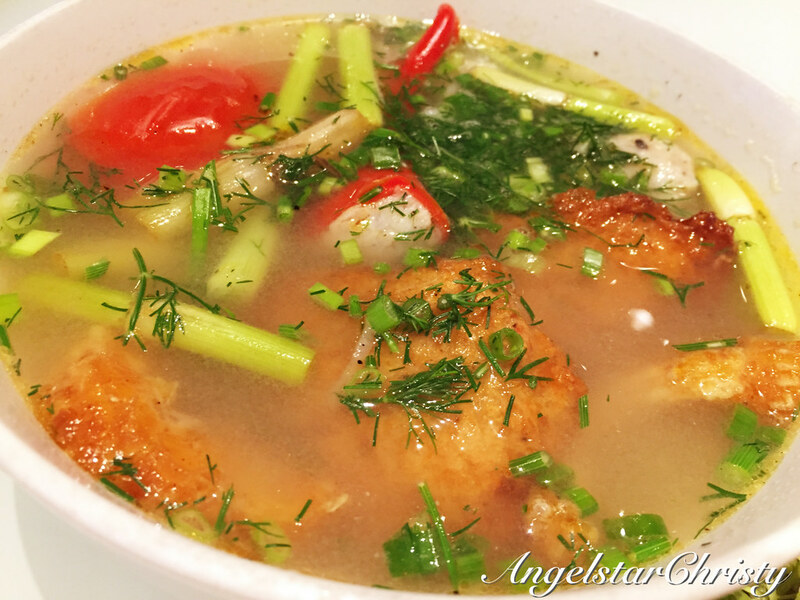 It is a light tasting soup filled with rice noodles amidst fish cakes and small cuts of fish fillets along with vegetables. To add more to the meal, if you are not satisfied, there are two choices of the following fish which are highly recommended. I am really, a fish person. 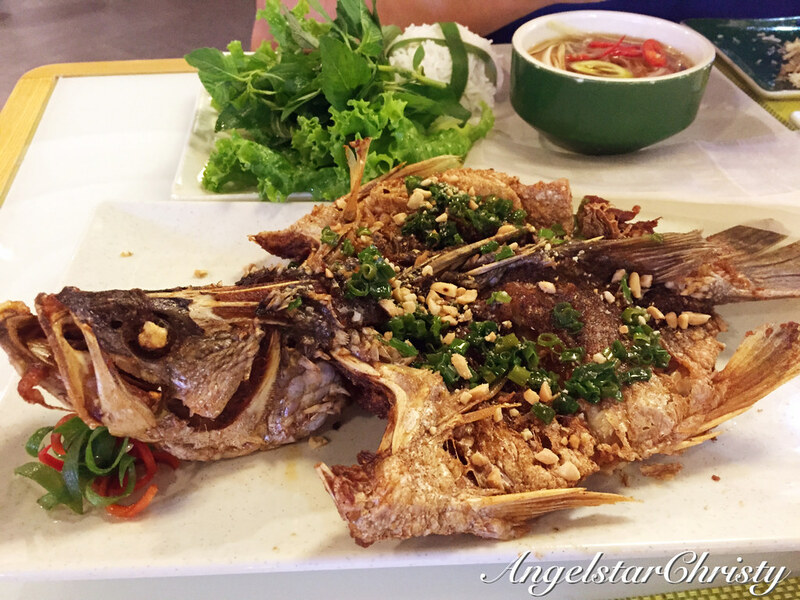 Ca Chem Chien Gion (VND198,000 or ~MYR38) is one of the local Vietnamese favorite style of preparing their fish. The deep fried style till it is crispy till it crunches in its sound. They just love their fish this way, and this is one of the most commonly found way of preparing their fish. Over here, this is the Deep fried seabass served with their specialty mango sauce. Personally I prefer my fish steamed, but hey, you know what they say about when you're in Vietnam, just eat their way, right? I wouldn't dare to go against that rule. It is after all, part of making a trip interesting, when one truly delves into the lifestyle and even tastes of the local culture that makes the difference. 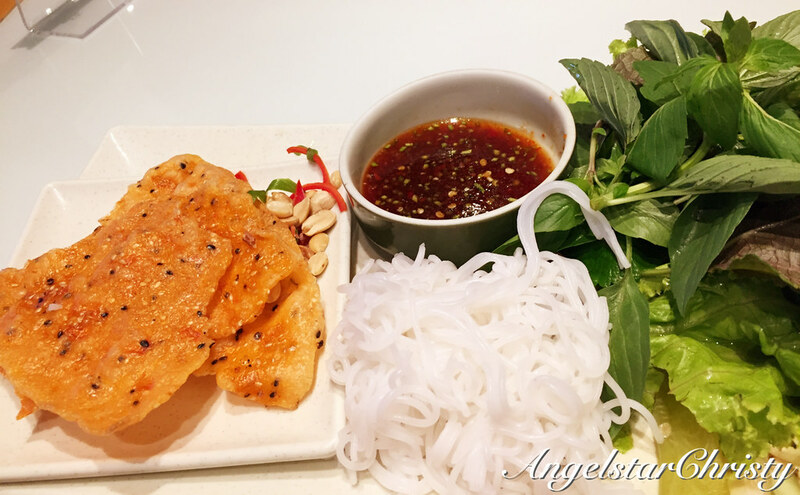 Another popular style would be this; the famous Cha Ca La Vong, or the Grilled fish with dill and scallion ala 'La Vong' style. 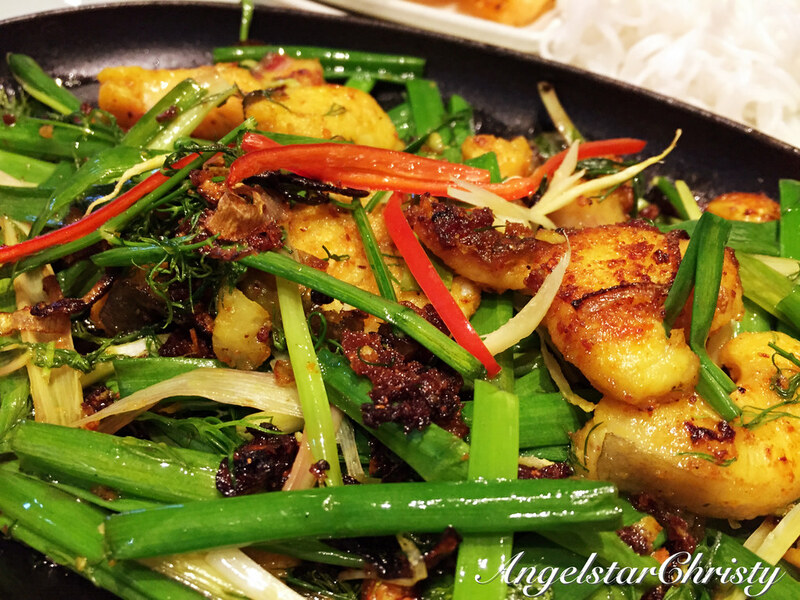 The fish usually used in this dish is the catfish and the La Vong style was said to originate from Hanoi (the northern part). While the dish maintained the simplicity in its preparation and tastes, staying true to the northern region's standards, the grilling part in the hot pan revealed the excessive oil used in the grill. However, overall, the fish meat was maintained in its tenderness and freshness, despite the oily mass bed of spring onion and dill stalks it was lying on. You would have gotten the drift by now, when you notice that plate of accompanying vermicelli, vegetables, sauce and even rice crackers by the side. You got it right; enjoy your option of wrapping your fish fillets in the leaves and throw in the bits of crackers before diving into the sauce. 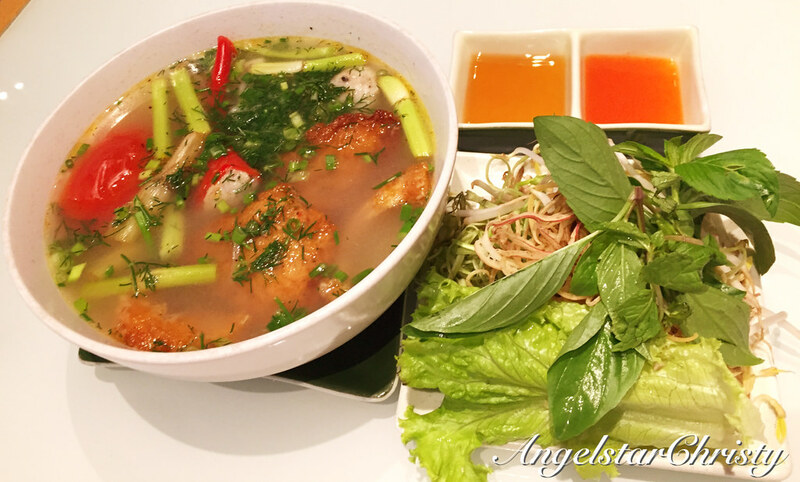 It may be all the same when it comes to Vietnamese food everywhere, but add that little twist and fun to it and you have got yourself a customized version and even your own brand. 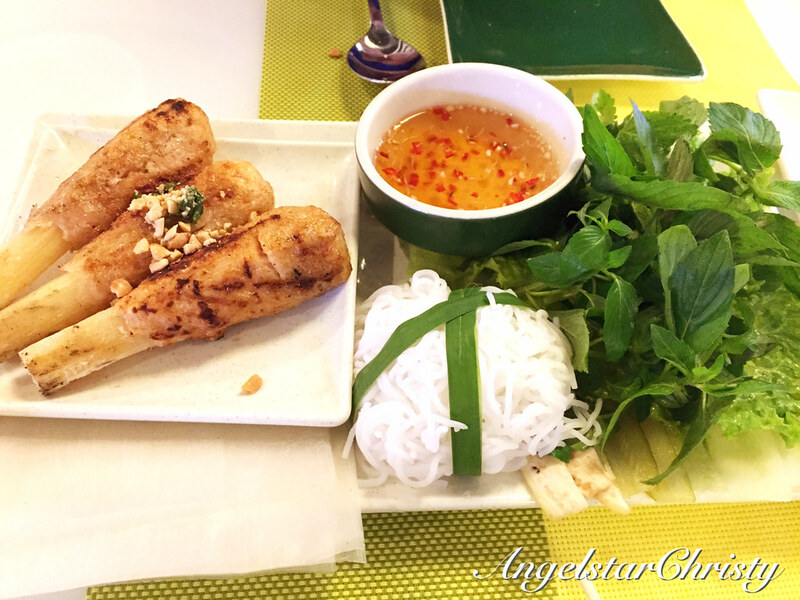 That is what this fast growing chain of local Vietnamese restaurant is all about; or it is more of a fast food outlet style. 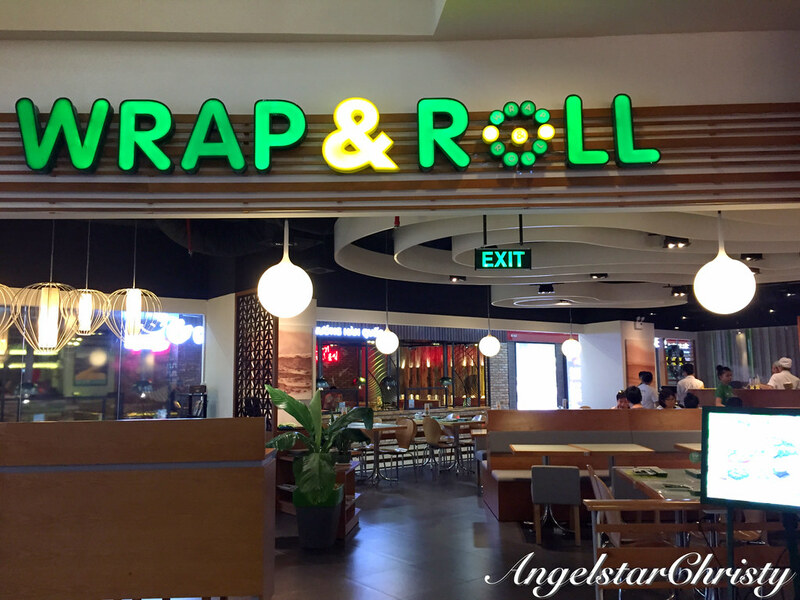 Wrap and Roll is a homegrown brand, pledging to maintain the authenticity of the Vietnamese food and bringing it to the table to share with everyone around the world. They have even expanded to outlets internationally; they even have outlets in Singapore and Sydney and they are continuing to grow. I was pleased to chance upon them which made me get that glimpse into the local Vietnamese varieties, and in a comfortable environment, not to mention at fixed prices. Well, this is not sponsored nor an invited review, but I have enjoyed my experience and based on the much more varieties they offer, I am sure there is something for everyone out there. After all, that's what I had with several visits and accumulated the above dishes, which are, by the way, mostly best sellers and highly recommended by the restaurant itself, as indicated on the menu. You didn't really think I had ALL that food in one visit, did you? If you did, wow, you have such high opinion of me. Service may not be as prompt as you hoped, and somehow not many of the staffs could speak English fluently. However, the menus are thankfully equipped with both Vietnamese and English translations along with pictures to make it easier for even tourists to order. When you request for your bill, they will come over and utter something in Vietnamese which is actually to request for your membership card (they always ask if you have membership cards - it is common in almost every outlet I have been to). You can just smile and shake your head and just give them the payment, by cash or credit card. (Credit cards are accepted here too). 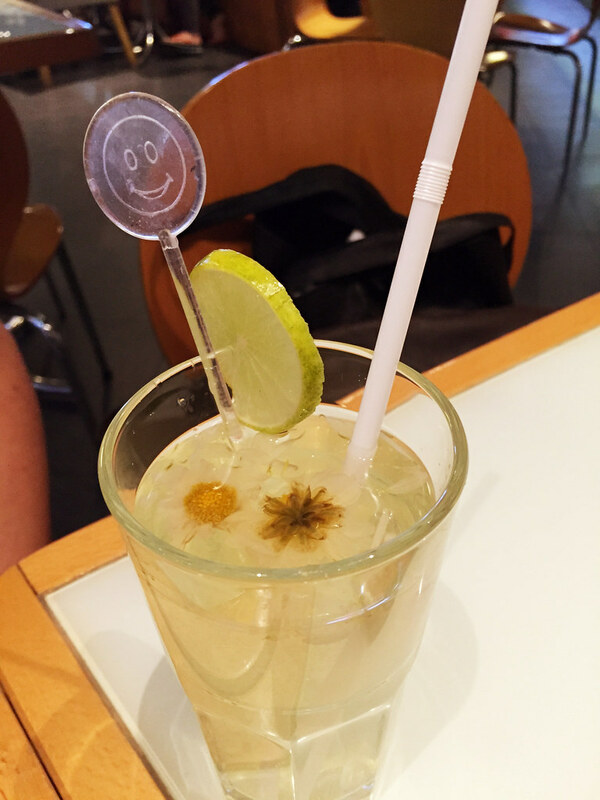 Well, they may not be understanding your language nor can they tell you how pleased they are with your visit, but they have incorporated that bit into their presentation and also in their drinks. Yes, service with a smile, always. So, are you ready to do-it-yourself, and take your tastes of Vietnamese food with that little action of Wrap and Roll?